Oittm Vintage Television Design Apple Watch Stand makes daily charging a breeze. Just set your watch on, from out of the corner of your eye, no careful alignment required. Locks to your bedside table so you never have to hunt for the cord. Undocking is one-handed. Solid, soft, seamless construction. Low-profile, minimal design. -Simpily turn your Apple Watch into a table-top alarm clock and messaging system with this charging stand. -Ideal solution to charge your Apple Watch in the car. Make the car watch holder stand firmly on your car and won't slide or fly out even taking a sharp turn, sudden stop or accelerate. 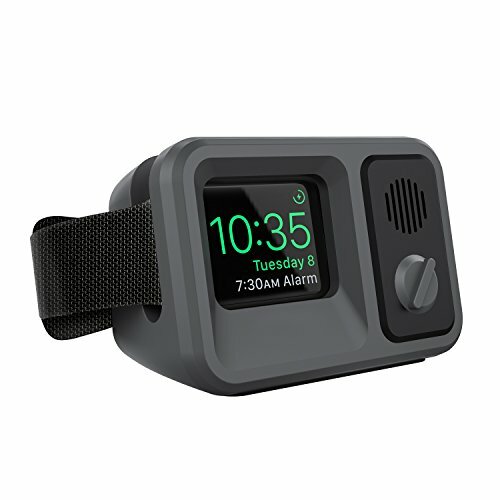 -Convenient: Keep your Apple watch in sight, easy to put in and take out. -Not only a well-crafted and cute take on an Apple Watch stand, but a pitch-perfect miniature for the vintage television of yore. -Made from scratch-free silicone to prevent damage to your Apple Watch. 1. Clean your desk or dashboard, make sure the surface Dry and No dust, and then remove the base transparent film before installation. 2. Wash the base with water when you want to move it to another car. 3. The stand could not stay sticky if the dashboard waxed. If you have any problem, please contact us by email freely and we will always be here to service for you. Classic Television Vintage Look: Looks just like an old time TV. Simply slide your Apple watch onto the stand to charge and admire a pitch-perfect miniature for the vintage television of yore. Premium Construction: The stand is molded in solid, medical-grade silicone with a gorgeous matte finish. Its softness has a pleasant amount of flex, and comes in beautiful colors. Protects your Apple Watch from scratching. Easy to Use: Precise cutout and minimal aesthetic design compatible with Nightstand mode and access to key functions of your watch like messages, alarm, provides comfortable experience with your Apple Watch. Compatiblity & Worry-free Warranty: Compatible with both 38mm & 42mm Apple Watch all models. We intend to offer you a 100% satisfying purchase experience. Please kindly contact us if got defective items, we take care of all quality-related issues with a replacement or refund. DISCLAIMER: Charging Cable and Apple Watch not included.